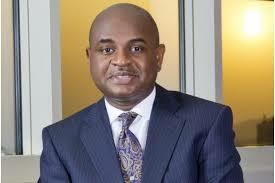 *All i can say is that Mr Moghalu is a President waiting to happen to Nigeria but we just dont know it yet....If you have not watched this man talked or studied him,you wont understand what i mean..I pray God gives him the patience to wait for the appointed time......Respect to you Moghalu! Unfortunately Stella, the powers that be can never allow people like him rule the country. They are too demonic and backward for a thorough bred like this. I agree with you Stella.In my own opinion,he is the best candidate in this 2019 presidential election.This election most likely would be rigged. We will vote for Moghalu,he might not win this time but definitely, he's a symbol of hope that Nigeria can and will be great again. The Man is in for real Change. The guy is good but some parts of this Nation dont want intelligent guys. Truth is most Nigerians ain't ready for a young mind with fresh ideas and insights, that's why the old ones will keep milking us dry. Na God hands we dey. This is my man. Sadly, evil workers of iniquity and power drunk old men won't allow him be great. I was rooting for Fela, but he confirmed my suspicions about motivational speakers. When it comes down to the nitty gritty of the matter, they only talk. seriously he is best candidate among all. I wish Nigerians will see beyond ethnic and sentiment and vote him. we should stop recycling old men that doesn't have our interest in heart. Mr. Kingsley Moghalu might be a great rhetorician,but see nothing different from madam Kemi Adeosun approach in stabilizing our currency against dollar, as free fall will definitely land $1 to 1,000 naira. IMF/worldbank economic policy hardly work for asia/africa problems. This guy with his unlike able face... Na only social media campaign im dey do..